WASHINGTON — Despite ongoing tensions in the South China Sea and several recent aerial confrontations, China has been invited to attend next year's U.S.-hosted Rim of the Pacific exercises, the U.S. Navy confirmed Monday. "All 26 nations that participated in RIMPAC 2016 have been invited to return for RIMPAC 2018," Cmdr. Ryan Perry, a spokesman for the San Diego-based U.S. Third Fleet, said Monday in response to a query. The Pentagon granted permission for China to be included among the participating nations invited to a June planning conference in San Diego, Ryan confirmed, following congressionally mandated guidelines governing military-to-military and naval-to-naval engagements with China. Further approvals will need to be obtained for two more planning conferences as the exercises approach, Ryan confirmed. RIMPAC, held every two years, is billed as the world's largest naval exercise and is usually centered on Pearl Harbor, Hawaii. The exercises, sponsored by the U.S. Pacific Fleet and hosted by the subordinate Third Fleet, run over several weeks and include numerous social and athletic engagements before heading to sea for a variety of operating scenarios. Countries participating in the 2016 RIMPAC exercises were Australia, Brunei, Canada, Chile, Colombia, Denmark, France, Germany, India, Indonesia, Italy, Japan, Malaysia, Mexico, the Netherlands, New Zealand, Norway, China, Peru, South Korea, the Philippines, Singapore, Thailand, Tonga, the United Kingdom and the United States. According to the Third Fleet, the armada assembled for the 2016 exercises included 45 surface ships, five submarines, more than 200 aircraft and 25,000 personnel. Chris Cavas, Defense Naval Warfare Correspondent discusses what to expect from this year’s RIMPAC Naval exercise in Hawaii. If China accepts, 2018 will mark the third consecutive RIMPAC exercise where units of the Chinese People’s Liberation Army Navy, or PLAN, have taken part. Five PLAN ships participated in the 2016 exercises — a destroyer, a frigate, a submarine rescue ship, a supply ship and a hospital ship. 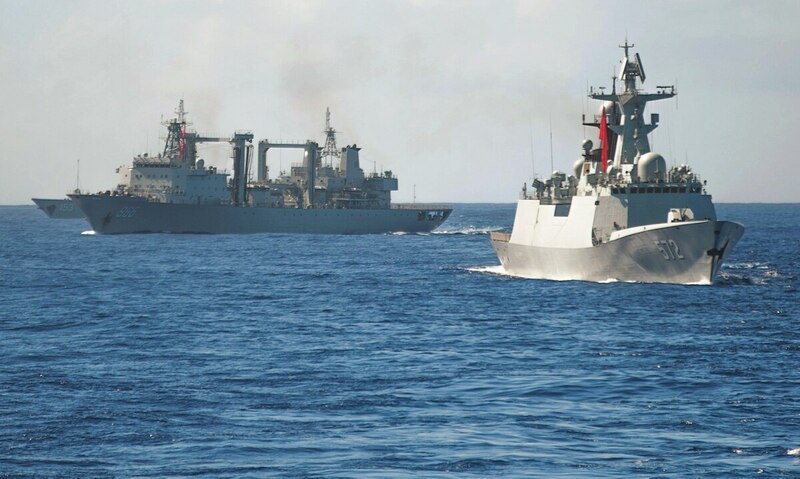 Four Chinese ships took part in the 2014 exercises — the same mix of ships minus the submarine rescue ship. Somewhat infamously, a Chinese intelligence ship shadowed the exercises, although it was not part of the official RIMPAC team. Russia also has officially participated in RIMPAC — once, in 2012. The Russians have not been invited back, although an intelligence ship and a destroyer shadowed RIMPAC participants in 2014 and 2016. Exact dates for the 2018 exercises will be determined during the planning conferences, Perry said. The exercises generally run over several weeks, and in 2016 a satellite exercise took place simultaneously in southern California. Chile, a RIMPAC stalwart, will be highlighted in the 2018 exercises, Perry added, with Chilean officers acting for the first time as the combined force maritime component commander. Sino-U.S. relations have recently seen both ups and downs, particularly as the U.S. has sought to enlist Chinese aid in dealing with nuclear-armed missile threats from North Korea. A summit in early April between Chinese President Xi Jinping and U.S. President Donald Trump at the latter's Mar-a-Lago resort in Florida seemed to go well, according to both sides; although after a pause, North Korea resumed aggressive missile testing. But a freedom-of-navigation passage on May 24 by the U.S. destroyer Dewey near Mischief Reef in the South China Sea annoyed the Chinese. And on at least two occasions since then, Chinese aircraft have flown dangerously close to U.S. patrol planes, according to the Pentagon.